BestCloudHostingASP.NET | Best and Affordable MS SQL server hosting. Today I will share tutorial about how to back up and restore MS SQL SERVER Database with WebSitePanel or Plesk. It is of great necessity to back up and restore the whole SQL database in case for any data loss caused by a system failure. Besides that, a SQL server usually maintains a wide set of system-level databases, and you will have to make a regular copy of your database after any important updates. At this place, we will discover the detailed steps to make a backup copy of your MS SQL database and demonstrate how to restore it. Note that, we would like to take the example of the mostly-used control panels in the world of Windows web hosting, namely WebSitePanel and Plesk control panel. In most cases, to back up and restore a MS SQL database requires a Microsoft software application named as SQL “Server Management Studio.” But things can become much easier for webmasters who already have Windows hosting accounts with WebSitePanel control panel included. In the following, we would like to explain how to back up and restore your MS SQL database with the use of WebSitePanel step by step. As usual, you should firstly log into your WebSitePanel account with unique username and password. Once you have entered the admin page, you will notice that there are many editing options, including “Domains”, “Web”, “FTP Accounts”, “File Manager” and much more. Here, move your computer mouse to the “Database” icon and select the very database that you are using now. If done, you will be switched to a new page where you are able to create a new database according to your requirement. At this place, you should search and select out the database you want to back up. Note that, you can choose to search it by “Username”, “Full Name” or “E-Mail.” Once done, make a click on its name and then you will be able to enter another settings page. On this “SQL Database Properties” page, you can have an overall look at your “Database Name” and “Internal Server” as well as “External Server.” Other database related information, such as “Users” and “Database Files”, is also shown. As you can see, this new “Backup SQL Database” page allows you to make some necessary settings before your backup. In the below image, you will need to verify your “Backup File Name” firstly, and then decide whether to have a “ZIP Backup” file. And in the “Backup Destination” section, you are allowed to download the previously-made backup file through HTTP or to copy it to a unique folder. Don’t forget to click on the “Backup” button at last. It takes a while to accomplish this backup process. When the backup is completed, you will have to download this “.zip” or “.bak” backup file to your own computer or a local server via FTP program. After downloaded it successfully, you need to delete the backup file from your server. For your data security and integrity, it is recommendable to back up your MS SQL server database periodically. If needed, you can choose to restore your database by simply clicking the above-mentioned “Restore” button under “Maintenance Mode”. And then, you will need to click the “Hosting Space File” option so that you can restore a database based on the saved backup file. Alternatively, you are able to select the “Uploaded File” option to achieve your goal. Before you start out to “Restore”, make sure that everything goes right as expected. ASPHostPortal.com is the leading provider of Windows hosting and affordable MS SQL Server Hosting. ASPHostPortal proudly working to help grow the backbone of the Internet, the millions of individuals, families, micro-businesses, small business, and fledgling online businesses. 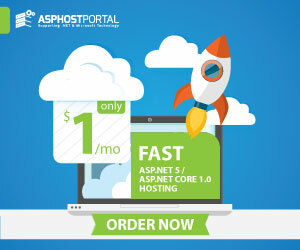 ASPHostPortal has ability to support the latest Microsoft and ASP.NET technology, such as: WebMatrix, WebDeploy, Visual Studio 2015, .NET 5/ASP.NET 4.5.2, ASP.NET MVC 6.0/5.2, Silverlight 6 and Visual Studio Lightswitch, ASPHostPortal guarantees the highest quality product, top security, and unshakeable reliability, carefully chose high-quality servers, networking, and infrastructure equipment to ensure the utmost reliability. 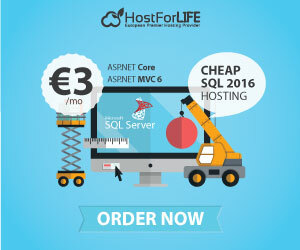 HostForLIFE.eu guarantees 99.9% uptime for their professional SQL SERVER hosting and actually implements the guarantee in practice. HostForLIFE.eu is the service are excellent and the features of the web hosting plan are even greater than many hosting. HostForLIFE.eu offer IT professionals more advanced features and the latest technology. HostForLIFE.eu has supported Crystal Report 2013, Relibility, Stability and Performance of servers remain and TOP priority. Even basic service plans are equipped with standard service level agreements for 99.99% uptime. Advanced options raise the bar to 99.99%. HostForLIFE.eu revolutionized hosting with Plesk Control Panel, a Web-based interface that provides customers with 24×7 access to their server and site configuration tools. DiscountService.biz is The Best and Cheap SQL SERVER Hosting. DiscountService.biz was established to cater to an under served market in the hosting industry web hosting for customers who want excellent service. DiscountService.biz guarantees the highest quality product, top security, and unshakeable reliability, carefully chose high-quality servers, networking, and infrastructure equipment to ensure the utmost reliability. DiscountService.biz has ability to support the latest Microsoft and ASP.NET technology, such as: WebMatrix, WebDeploy, Visual Studio 2015, .NET 5/ASP.NET 4.5.2, ASP.NET MVC 6.0/5.2, Silverlight 6 and Visual Studio Lightswitch. DiscountService.biz is devoted to offering the best Windows hosting solution for you.